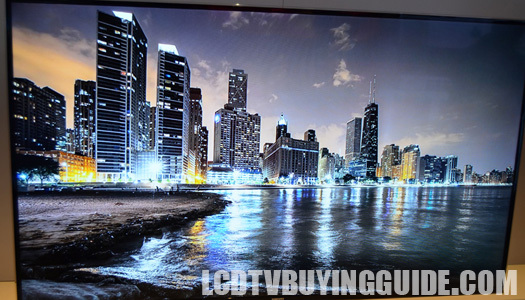 This bright 50 inch edge lit LED TV provides a brilliant picture. The edge lighting also helps to balance out the downsides of the matte screen by providing rich colors and strong contrast. All of that said, from relatively close to front and center we felt the picture displayed was very good with lots of light flow-through to help with depth perception. The picture is remarkably similar to the F6300 from last year. A full 10-point white balance adjustment option that makes getting colors accurate easy with the right settings. The UN50H6350 has a retail price tag of $1,199. This is a good value considering the screen space and the sheer amount of features packed into this one. The 48 inch size is available for $200 less and presents an even stronger value if you don't mind losing 2 inches of screen space. 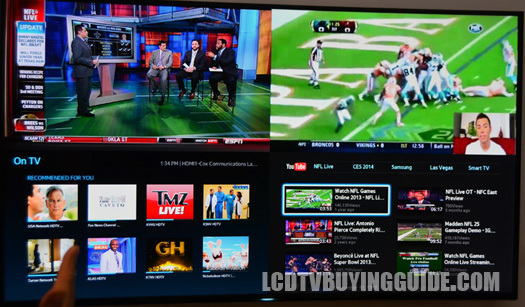 Samsung still boasts the best selection of apps in their smart TV platform. When it comes to quality of free and paid apps, they beat out the competition as well. The Premium Apps such as the movie services, sports and music are also top notch and include the usual Netflix, You Tube (though we like Youtube through the browser better), Facebook (browser is better here too), Twitter, Vudu, Amazon, Hulu Plus. Allows tweets on right hand side of screen streaming while you watch programming. Allows that social aspect to see what others are thinking. All of this is powered by a quad core processor for excellent speed and performance. The built-in wifi connected to our network flawlessly and quickly. We had everything up and running in no time at all. The Web Browser on the 50H6350 defaults to a Bing search bar. The browser is slow to use with the 5-way controller on the remote but loads content quickly and the Wifi connectivity is just as strong as last year's stellar performing model. The UN50H6350 makes use of the chrome colored Samsung quadrapod design that we have seen before. The matte silver finish on the quad legs is a nice touch. The bright reflective chrome stands are usually too much in our opinion. The bezels and profile are very thin to give the TV an attractive appearance. For those who don't like the look of the 4-legged stand, wall mounting is always a viable option. The UN50H6350 sells for $200 less than the H6400 series above it. That $200 can be spent on better speakers, a blu-ray player, or go towards a game console. That is, if the extra features like 3D and microdimming aren't important to you. 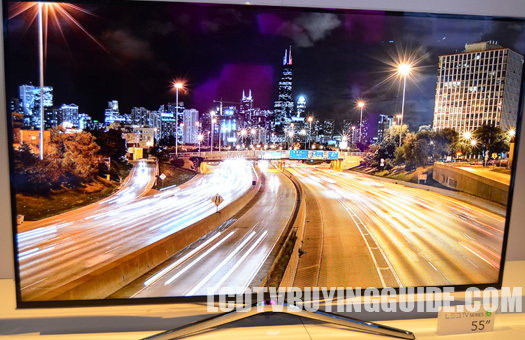 Similar value TVs like the Vizio E480i-B2 sells for about $300 less, but you are going to miss out on picture quality and a stout smart TV experience. Dimensions without stand (W X H X D): 44.0" x 25.8" x 2.5"
Dimensions with stand: 44.0" x 28.9" x 12.1"
Weight without stand: 28 lb. Weight with stand: 31.5 lb.